As startups stay private longer with higher valuations, individual investors are gaining access to invest via special purpose vehicles (SPV). These SPVs are being created and managed by venture funds. The SPVs also enable venture funds to write bigger checks to compete with the billions of dollars pouring into later-stage startups from mutual funds, hedge funds and banks. Historically banks have created SPVs for their own wealthy customers, giving clients special access to hot deals. For example Goldman created an SPV in 2011 to market shares of Facebook year before the social network went public. When image-bookmarking site Pinterest Inc. set out to raise more than $500 million in February, one of its earliest investors, FirstMark Capital, wanted to take part in the round. 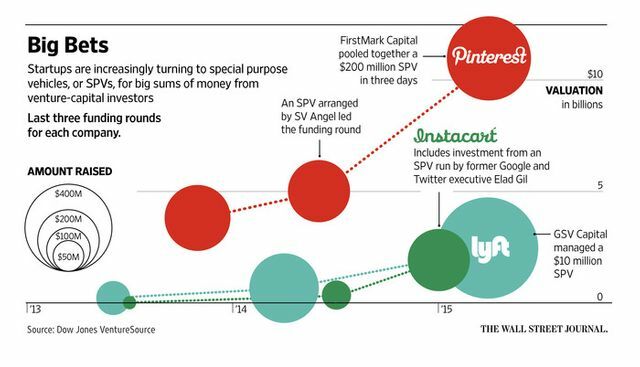 But the venture firm couldn’t invest a big enough sum from its $225 million fund to keep pace with Pinterest’s steep proposed valuation of $11 billion, more than double the price from May... So Rick Heitzmann, FirstMark’s managing director and a Pinterest board observer, struck a deal with the San Francisco company to create a special fund that would pool capital from other investors and take a direct stake. In just three days, Mr. Heitzmann rounded up $200 million from seven of FirstMark’s investors and included a small of amount of capital from its main fund, according to a person familiar with the deal.